on the 18th? I'll have my receptionist book us. talk like we always end up doing." "Thanks dad. I'll see you at our usual table." words. "I'll see you later, pop." clicked with a snick briskly a second later. in the icebergs are widening.." said Dix. to Dr. Brackett in salute. "Any indication what it is we got?" 51's blank run sheet slate back to Dix. on a patient or two while I'm waiting. Page me when 51 fires up." as if with a private observation. Kel didn't miss it. "What?" quite as rosy, down right creepy at that. to walk around the room, sniffing, suspicious. Chet and the gang started to copy him. Johnny immediately tensed. " Cap, what is it? You smell smoke or something?" Cap shook his head. "No..no.. not smoke..
"Cinnamon ginger bread.." Chet said. that's what I'm smelling. Gingerbread." the guys faces..and he clarified defensively. "You know.. the kind grandma always makes. And it smells like it's coming from over..."
stoves and ovens met their eyes. to him and Gage felt for a pulse. "He's alive.."
over sized, old fashioned pump water handled sink. Mike turned off the gas in the oven. Roy shouted to his patient. "Hey,.. Mister.. Can you hear me? We're L.A. County Firefighter Paramedics. his breathing, right where he was. Cap lifted his handy talkie to his mouth. took off their helmets and got to work. "Want him on the floor?" "Not yet. We don't know what we have. John who immediately got them set. Gage and DeSoto when they were ready. down, while John got a BP. "It's 90 over 64. Pulse 110 and thready." Roy said, "His respiration rate's 22 and shallow. pupils being careful not to move him much. Mike helped Roy patch the man up. got him oriented as to what was happening. "Easy there. Take it slow. How are ya doing?" Roy said to him. "Know where you are?" out his green pen from the biobox's lid. 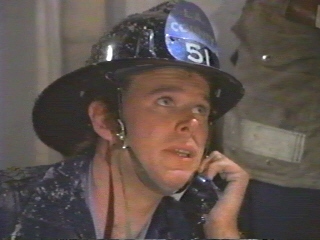 "Rampart, this is Rescue 51, how do you read?" ..from Dixie. 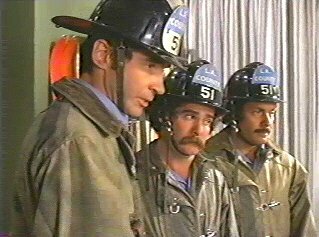 "Rescue 51, I read you loud and clear." "10-4. Relay your telemetry and I'll page Dr.
Brackett. Please stand by.." Dixie answered. inhouse operator. 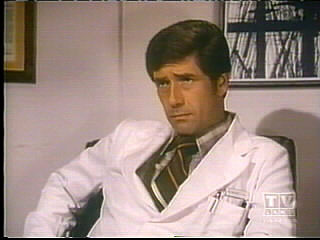 "Would you please page Dr.
Brackett to the base station, stat. Thanks." Roy in the meantime, put on his best paramedic smile. up to his face to the mask flowing oxygen there. all afternoon's work.." he said. world like Mr. Hooper from Seasame Street. got the gas turned off for ya." a new breathing rate. "So, what's your name? Can you tell me that?" "Eh? Oh, oh. It's Fajou.. Reginald Arthur Fajou. war.. or was that WW One?" he gasped. in a little distress here." I got asthma.. and....that's about it...."
"Who's Martha?" Roy asked. "Your wife?" a doctor take a look at you, ok?" Roy asked. "All right. If you say I have to go.. I I will. 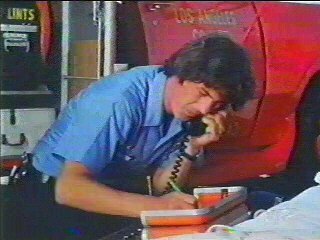 while Johnny got Kel Brackett on line. the metal drum Johnny placed on his skin. Arthur's consciousness level to good. down gesture. Gage said, "COPD's confirmed." "Y- Yeah.. That's why I came into the kitchen. see? But then I *cough* got a little dizzy..
and the room started spinning round and round. I got scared, you know.. So I called for help. feeling so good today.." Arthur sighed softly. on the wall. "Say,, Arthur.. I know this movie..
"Heh.." Arthur grinned around his mask. every once in a while...to make a movie..
Chet and Marco both nodded. "Sure do." have an iron maiden in the basement down there? could use the eye on him. "This is Dr. Brackett, go ahead, 51." does sound a little wet on the left side. And his breathing's slightly labored.